When Rose Bowl Stadium was built in 1922, only three sides of the structure were erected. The $272,000 effort to build the structure left it open on the southern end. 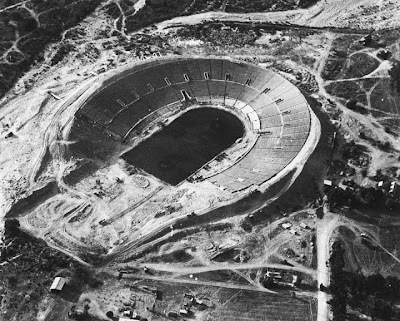 Alabama's first two appearances in the New Year's Day classic – in 1926 against Washington and 1927 versus Stanford – were played in the period the stadium was still in this configuration. The venue didn't become a true "bowl" until the southern stands were completed in 1928. 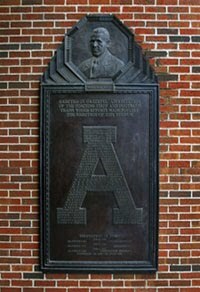 The $115,000 price tag for the expansion was funded through the proceeds from the highly attended 1926 and 1927 games. Johnny Mack Brown, the star of the 1926 Rose Bowl for Alabama, explained it to Sports Illustrated in 1962. "The Rose Bowl wasn't really a bowl. It was more of a horseshoe" he said. "One end wasn't closed. Alabama closed it for them."